Earlier this year my husband and I tied the knot at City Hall in downtown Manhattan. We’re still going to have our dream big church wedding with family and friends next summer, but having a civil ceremony in advance was the best decision we made. Not having to worry about such matters as living arrangements, organizing finances, getting all the in-laws on the same page, dealing with various documents and formalities takes a great deal of pressure off your shoulders. Now we can focus on just the fun part of organizing the wedding festivities. White Pants: Wide-legged white pants can be the perfect way to look bridal and have the essence of an long gown but not actually wear a long wedding dress at city hall. "NK Bride "Holly Flower" Mesh Top Embellished with Multi-Colored Silk Hand-Made Flowers & Swarovski Crystals & NK Bride "Leah" Wide-leg High-waist Silk Pant"
White Jumpsuit: It’s casual and fun but also bridal!! And best of all if there’s a line at City Hall, you don’t have to worry about having to cross your legs. A lace one is extra bridal and feminine. White Leather Jacket: Pair it with anything! Even jeans and a tee. Click here to view this look "NK Bride "Nathalie" Cropped Lambskin Leather MC Jacket Embellished w/ Hand-Made Leather Flowers & Swarovski Crystals"
Short Fashion Forward Wedding Dress: A city hall wedding is the perfect opportunity to be a really fashion-forward bride and wear something modern and a little avant-garde. 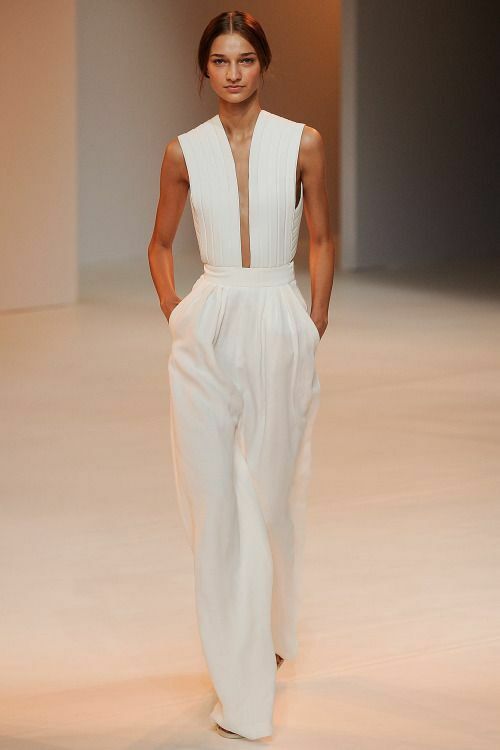 Business Suit: A white (or whatever color you want) business suit can make you feel powerful on your big day. Take it on like a boss! Whether you opt for a skirt or pants is up to you! Crochet Or Lace Dress: This yarn-style is perfect for the laid back bride. There are so many different and intricate kinds of crochet and lace patterns to choose from. Add a boho bell-sleeve and channel your inner Stevie Nicks They are flattering and bridal without being too traditional. Vintage-Style Veil: You and your partner may decide that you just want to wear jeans to tie the knot! But, you can dress up any outfit with a vintage style veil. 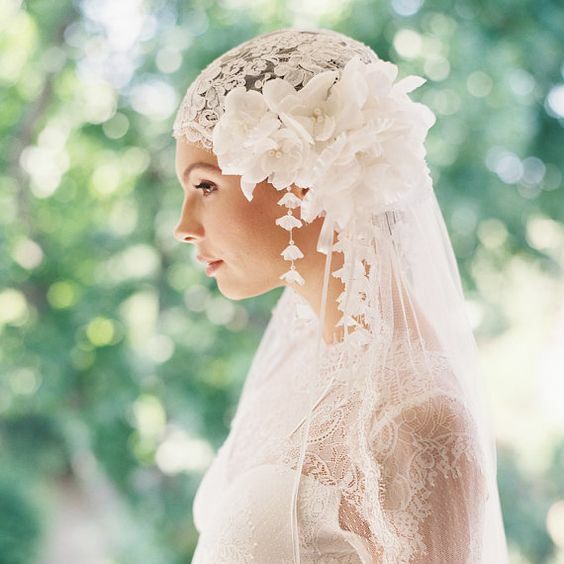 Juliet cap veils are timeless. The name originated from original drawings of Juliet from Shakespeare's Romeo and Juliet, where she was drawn wearing a similar style. Grace Kelly selected the style for her big day. Add this classic look to any outfit, and you automatically look like a bride, darling.